A Westonian with some mad cartographic skills has sent in a revealing map of the potential effects of Tory’s SmartTrack proposal. 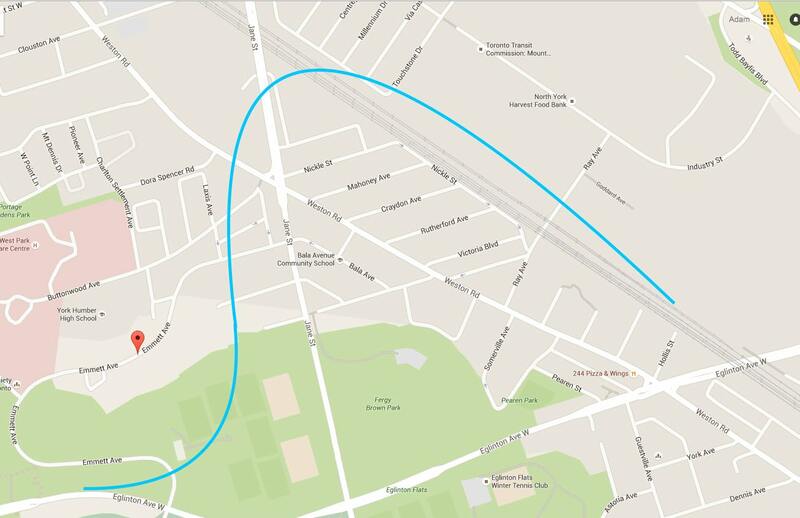 He made a detailed map of the “1D” alignment, which was “brought forward following public consultations”—and pardon my plain speech, but if this is the best we can do, we’re totally fucked. Our guest cartographer added high-resolution imagery, property lines, and a conservative guess at the width of the tunnel (in red). By my count, the 1D corridor would demolish at least 51 homes, and it would certainly affect far more. The ‘tunnel’ would be made through ‘cut and cover’, which residents of Weston are quite familiar with. Mount Denizens, take it from us: it’s not a tunnel. It’s a trench. It’s dug, not bored. You will lose your homes and your neighbourhood. There are other possible alignments for this LRT. Some go north, through Weston, on existing corridors. Others make different (even impossible) turns onto Eglinton. There are few details available. Our cartographer, however, who would like to remain anonymous, also threw into doubt the viability of plan 1A. It involves an awful lot of steep up-downs in a short distance to stay on the route—or, your correspondent supposes, the demolition and expropriation of property to avoid roads and bridges. Plan 1B had “little merit” according to the planners, leaving only plan 1C to discuss. 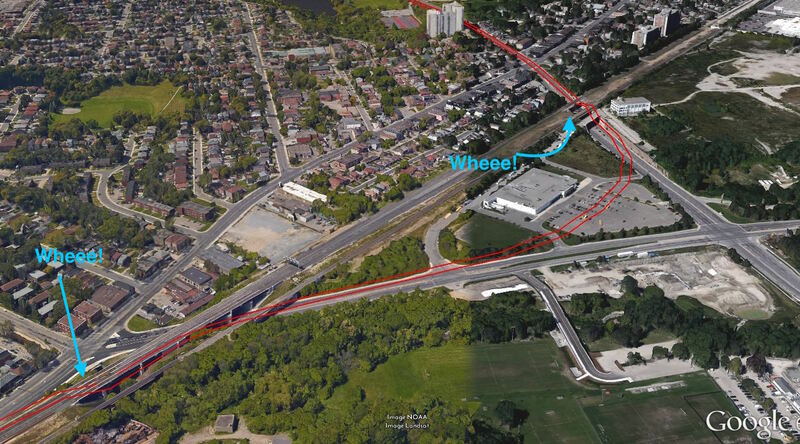 It would—brace yourself: Require widening the train corridor from Nickle to Jane (which would have an “impact” on properties, would have to be tunneled under the “industrial, residential and hospital” properties, and would cross the park on stilts. Emmett would be closed permanently. The details are not available, but I made a guess at it to give you an idea. 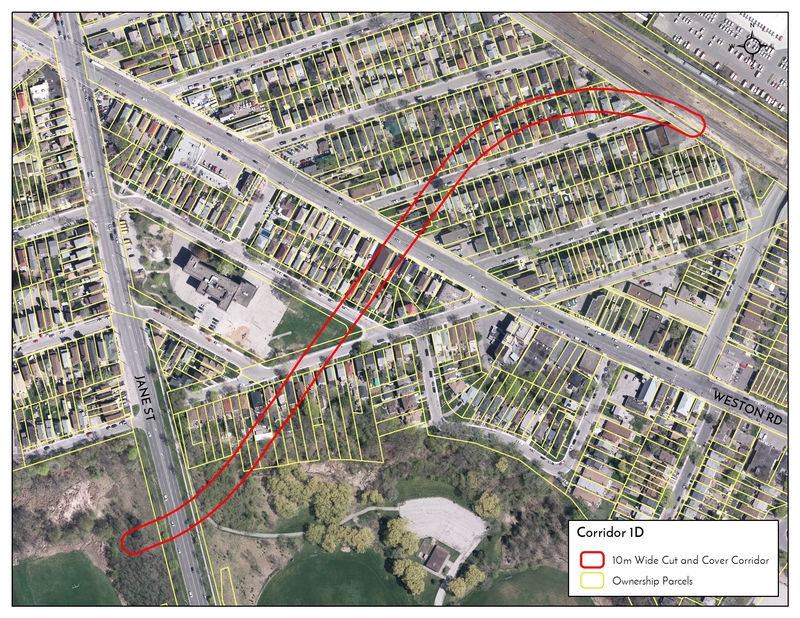 For all possible designs, there’s this to consider: “two additional parallel tracks ‘are highly likely’ to be required in the Kitchener corridor…. to allow SmartTrack to run alongside GO RER, UP Express and VIA Rail services”. Mount Denizens and Westonians, you might usefully consider whether we need GO service, UP Express service, bus service, and SmartTrack service at the cost of homes, businesses, and neighbourhoods, or whether, perhaps, there might be another solution. In all likelihood, SmartTrack will dissolve into the existing GO Regional Express Rail (RER) plan of 15 minute electrified service Bramalea to Union, and be supplemented by the already-environmentally-approved Phase 2 of the Crosstown LRT west to the airport.